The June sun baked down on us in an unseasonable heatwave. 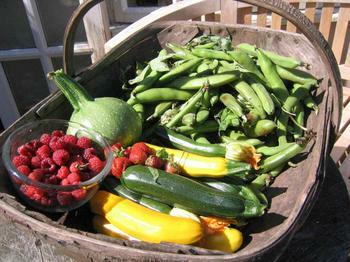 The grass turned brown and the sprinkler whirred endlessly as I struggled to keep vegetables and flowers alive. Frequent seed sowings in the polytunnel failed as seedlings fried as they germinated! And then the weather changed. Storms raged for days on end. Rain and wind lashed the valley. Paul sailed to France, and I struggled through the gale force winds to check the sheep on the top of the hill. The dogs were even reluctant to join me. 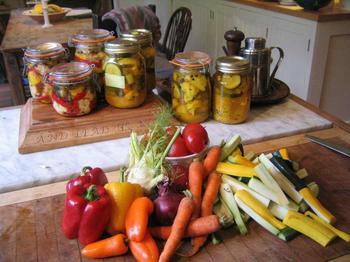 It never ceases to surprise me how simple it is to pickle vegetables. The real trick as with all food is to use really fresh produce; young fresh vegetables, good quality white wine or cider vinegar. Buy freshly prepared >strong>spices, not ones that have been sitting on the shelf since last year!. A really good airtight seal on all jars is also essential..